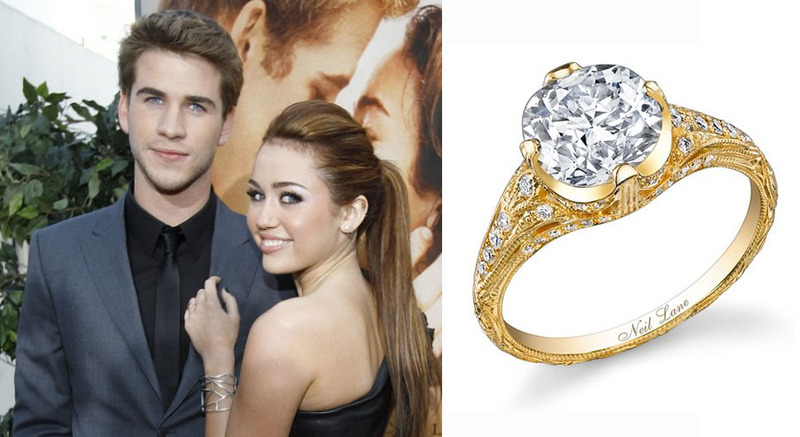 Miley Cyrus – 19, aka: Hannah Montana, got engaged to “Hunger Games” actor Liam Hemsworth -22, this past weekend and has been showing off her 3.5 carat cushion diamond and yellow gold ring. The ring was custom designed by celebrity jewelry Neil Lane in Los Angeles. She wanted a modern look, yet with a vintage touch. The 3.5 carat diamond is said to be cut around 1880 or 1890, at that time no two diamonds were alike as they were all hand cut and is worth around $100k. The gold is 18 karat with an art nouveau floral motif. The couple met while shooting the film “The Last Song” in 2009 and have been dating ever since. Cyrus was last year counted among the ten richest teens in the Hollywood, her net worth placed at $120 million. What do you think about the ring? This entry was posted in Celebrity Jewelry, Jewelry, Jewelry News and tagged liam hemsworth, miley and liam, miley cyrus, miley cyrus engaged, miley's ring. Bookmark the permalink.